Currently there are 5 slaves for the Eclipse hudson instance. 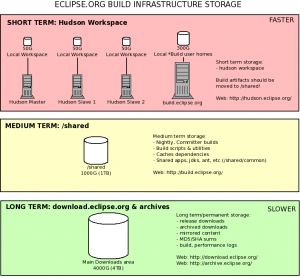 *Hudson-slave1 & Hudson-slave2 - these are the main build nodes for hudson jobs. You can specify them by name or by using the 'build2' label. *fastlane - this slave is intended for usage during a release train crunch when re-spins may require more capacity than hudson-slave1&2 can provide. By default jobs should not run here. Hudson-slave1 & Hudson-slave2 - these are the main build nodes for hudson jobs. You can specify them by name or by using the 'build2' label.